Where Do Scifi Fads In Mainstream Lit Come From? Dale Peck and Tim Kring's alternate-history novel is just the latest in a long history of mainstream authors lifting ideas from science fiction. But what sci-fi concepts have been most in vogue with literary publishers — and when did those fads peak? We decided to look at the biggest novels by literary authors that involved time travel, alternate history, or post-apocalyptic futures. And then we threw in larger political, cultural or literary events that could have influenced authors, publishers or readers. We discovered a shocking connection between real-life wars and the popularity of time-travel stories. What we found: As you might imagine, the real surge in literary novels with science fiction themes came in the past five or six years, after literary journal Conjunctions published its "New Wave Fabulist" issue and magical realism was on the wane. There were literary novels with SF themes, like David Foster Wallace's Infinite Jest, which didn't really fit into the general subject areas of "alternate history," "time warp," or "post-apocalyptic." We were most interested in seeing which years featured the most literary novels featuring those themes. Of those three subcategories, alternate history was the most consistent, with literary authors using it to explore how wars could have gone differently, but also other topics. Not surprisingly, you saw more alternate history novels at the start of this period, when the U.S. was active in Somalia and still bombing Iraq, and then at the end, when we had invaded Iraq. 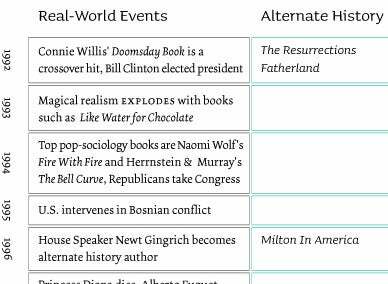 Alternate history is traditionally a fairly conservative genre, with authors like Newt Gingrich dabbling in it and exploring how things could have turned out worse if we hadn't stiffened our spines. But a recent spate of alt-history novels is more liberal, exploring a world where the Aztecs never fell (Atomik Aztex) and a world where the Jews got a homeland in Alaska and we avoided the Middle East conflict (Yiddish Policemen's Union). There was a boomlet in time-travel fiction, and stories about time acting strange, in 2003-2004, with Audrey Niffenegger's The Time Traveler's Wife proving a huge mainstream hit. This was the peak of the Bush-era resurgence in conservativism, with a lot of mainstream nostalgia about World War II and the Greatest Generation. And then was a boom in post-apocalyptic fiction in more recent years, with three huge classics of the genre hitting in 2006. In particular, Cormac McCarthy's The Road has become the poster-child for the literary-authors-going-speculative trend. These books coincided with the Indian Ocean Tsunami, Hurricane Katrina, and a worsening Iraq conflict. But there's been a lull in the post-apocalyptic genre since then as well.